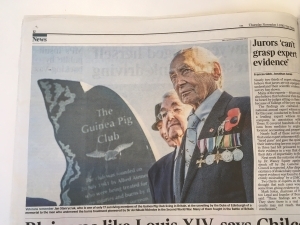 Last week saw the Royal unveiling of the memorial for the Guinea Pig Club. HRH The Duke of Edinburgh was present at the National Memorial Arboretum to remove the Union Flag that covered the 2m tall slate monument. He was watched by 7 of the remaining 22 members of the Guinea Pig Club, a group of airmen who were treated for severe burns during the 2nd world war by pioneering plastic surgeon, Sir Archibald McIndoe. 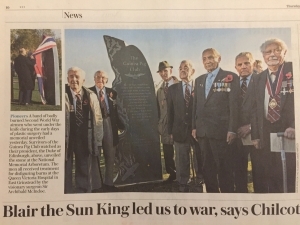 The event was filmed by all of the major news channels and recorded in a number of National newspapers ensuring that the story of these courageous war veterans received a huge audience. It brought to the end the conclusion of the project that began when Guinea Pig Dr Sandy Saunders visited my workshop over a year ago to discuss a memorial for the club. The memorial stands proudly at the National Memorial Arboretum and will continue to tell their fascinating story for generations to come.